It also makes me think of cosy times; warm toasty baking smells, hot spiced drinks, fluffy dressing gowns and a roaring fire. Bring it on. So given that myself and most of my family love the stuff it seemed only right to get my finger on the ginger and get baking. I haven’t quite mustered up the courage to test out a recipe for gingerbread men yet (but I will, I promise) but I quite fancied trying my hand at a gingerbread cupcake because I’m currently a bit obsessed with piping (I don’t get out much) so I wanted to bake something I could cover with creamy frosting. And what better pairing than gingerbread and vanilla? It’s a match made in cupcake heaven. 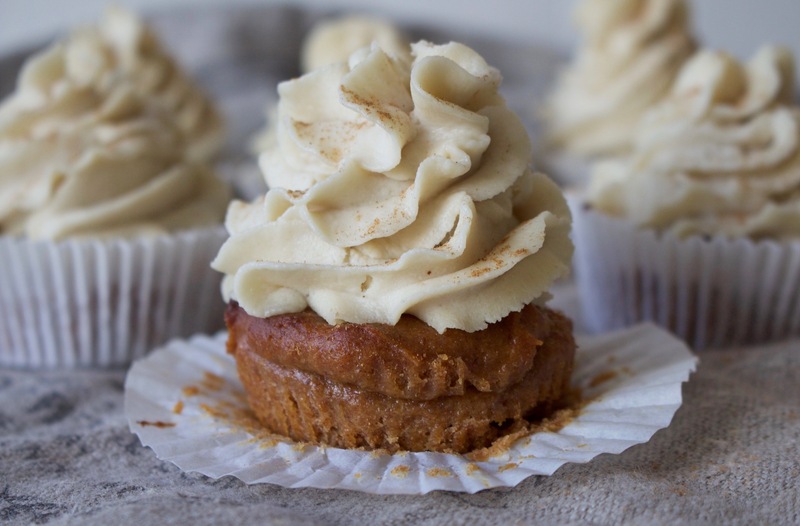 These little cakes are just divine – a light, moist, perfectly spiced sponge topped with as much sweet, creamy vanilla frosting as gravity would allow me to pipe on top. What a dream. Now all I need is a cup of tea, my slippers and said roaring fire (although I might have to move house for that, so just switching on the central heating will have to do for now). I hope you love these as much as I do! First preheat your oven to 180 degrees. 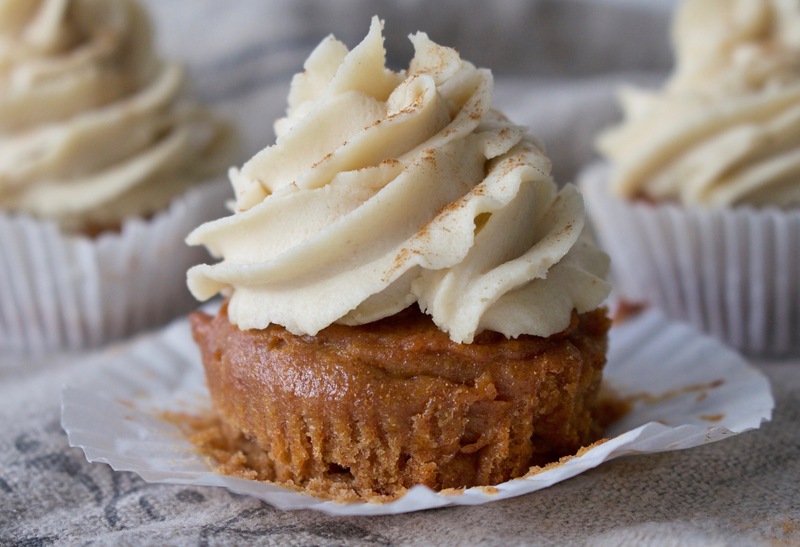 To make the cupcakes, add all the ingredients into a food processor and blend for about five minutes, stopping every couple of minutes to give the mixture a good stir, until you have a smooth batter. Spoon this into cupcake cases and bake in the oven for 20 minutes. Remove from the oven and place on a cooling rack for at least half an hour to cook while you make the frosting. For the frosting, place all the ingredients in a food processor and blend for around ten minutes, stopping every couple of minutes to scrape down any mixture that’s climbed up the sides. The result should be super smooth and creamy, not to mention delicious! Place in the fridge for 20 minutes so that it can set (otherwise it will be too liquid to pipe onto anything) then spoon into a piping bag and frost away! Hello! These look great! Could I substitute the flax eggs for real eggs do you think? Thanks! Hi there! I’m making these now but I don’t have flax seeds (not whole, I have ground), will chia seeds do instead?